It was once again our annual Christmas and New Year get together with my fellow Chemical Engineers. We decided to dine somewhere at the Terraces Ayala Cebu because some of them aren’t Cebu-based anymore and haven’t had a full look at the Terraces Ayala Cebu. Deciding for a place to eat was again another long debate. But good thing I narrowed it down for them according to what hasn’t been reviewed by the Pakalistas of DiningCebu.com. 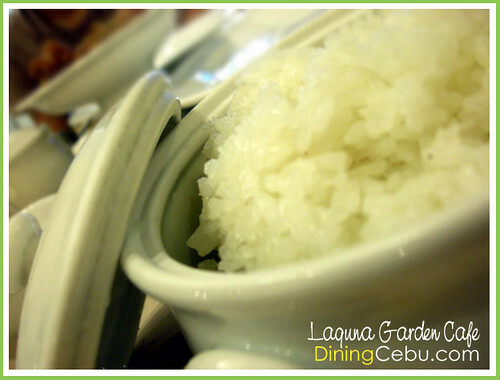 A long series of distillation, fractionation, leaching, evaporation, and filtration processes were conducted before it was decided to dine at this Filipino restaurant in Cebu – Laguna Garden Cafe. Who doesn’t like calamares right? Oh unless you’re allergic to squid so the calamares is your enemy! But I was a bit disappointed with Laguna Garden Cafe’s calamares because I would’ve wanted that they use a lot more Japanese crumbs instead of just flour. The taste is all right, no question about it. It is just my personal preference regarding the crumbs. But still I devoured quite a hefty number of calamares though so it’s still all good! The chicharon bulaklak was “inilog” like crazy by everyone that night! I don’t know why it is so yummy considering what it actually is uncooked! The first two orders we had was perfect. 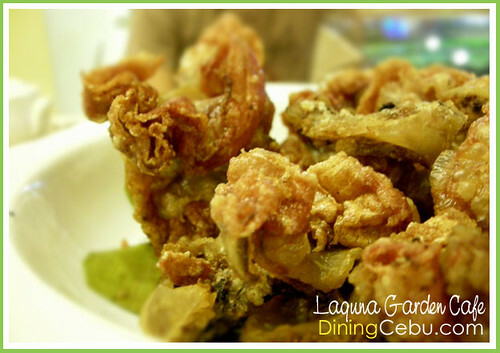 The bulaklak portion was crispy, but our third additional order was kinda soggy already and was obviously rushed. Again a disappointment there but still forgivable because the taste is superb! 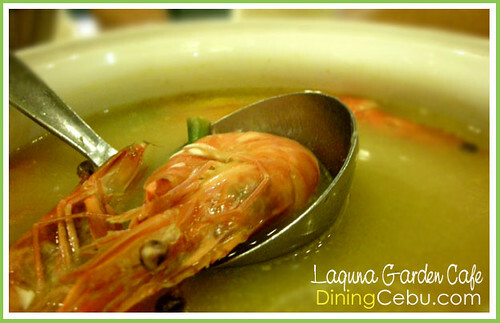 I have always loved sinigang sa sampalok be it prawns, pork, beef, and ohh except fish because I’m not a fan of fish. Laguna Garden Cafe made it a point to make their sinigang not extra “maasim” (sour) for those who doesn’t like it that way but those who do won’t be disappointed as well. I like how they served the Sinigang na Hipon because it’s in a palayok that has something burning underneath it so you always get your soup hot. This is nice because with a lot of food to devour, and forgetting about the soup after a few sips, you will totally lose interest in it when it’s cold. So good one there Laguna Garden Cafe! Well well well… What can I say? I mean Crispy Pata is Crispy Pata. This will always be a Pinoy food favorite. 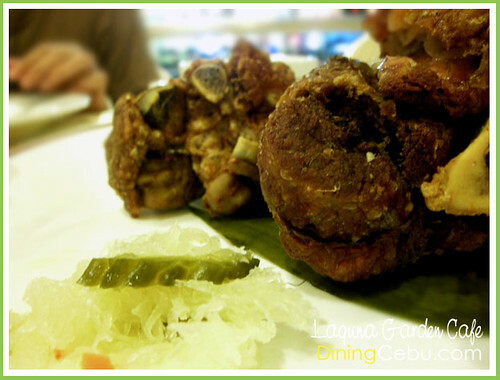 I liked that Laguna Garden Cafe’s Crispy Pata was cooked as crispy as expected and that the amount of meat was sufficient enough unlike in other Filipino restaurants where the bones rule the crispy pata. I forgot how the condiments (suka and toyo) tasted because I was busy with the crispy pata skin and couldn’t care less if the suka and toyo was worth contemplating about. Pandan Chicken is not my favorite Filipino food. I would’ve not ordered this if only I am in control of food ordering because there is nothing surprising about a pandan chicken. You’ll just get a simple chicken wrapped in pandan leaves. 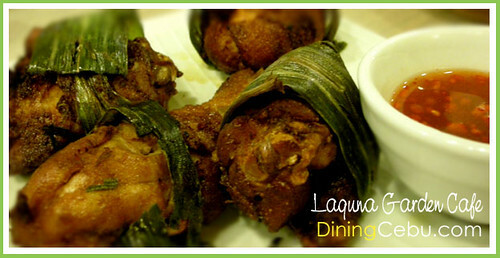 But, my oh my, to my surprise Laguna Garden Cafe’s Pandan Chicken was something different. The chicken was soft, and it had something out of the ordinary pandan chicken that you would normally get. I can’t explain it that well but trust me it’s different. The sauce is spicy hot too which is another plus. The last one to arrive at the dinner table! Normally I would not eat fish because there is pork around and even when there isn’t. I mean seriously guys, during beach outings, the lechon would always get consumed first before anyone touches or even care to look at the grilled fish. Off topic! So moving on, I tasted this one for blogging purposes! 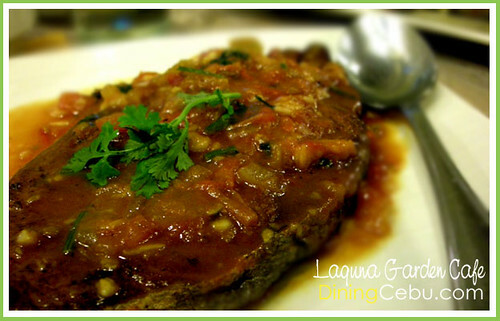 Wow, another surprise from Laguna Garden Cafe! I like the “timpla” and would have finish it all if it were only pork! I mean seriously you have to order this one guys if you like fish because I’m sure you won’t regret it. A Filipino meal isn’t complete without it! Don’t forget to order one ok, or make it two! You guys at Laguna Garden Cafe really impressed me with the pandan chicken and the fish sarciado. Laguna Garden Cafe has quite a wide range of food choices, and I bet they have in their menu every popular Filipino food you can think of! 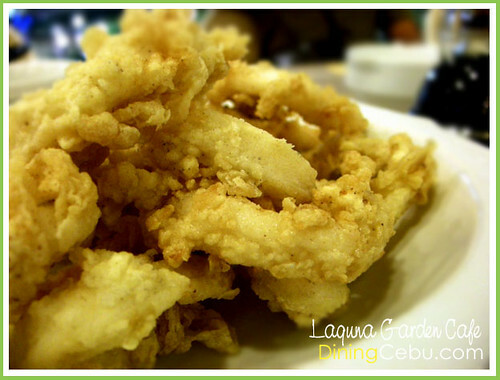 Laguna Garden Cafe is now one of my recommended Filipino restaurants in Cebu. « Where to dine on Sinulog Day? I used to love this place. Then the quality went down. I hope they can rediscover their quality. What i hate about this restaurant is that the food is served after 1-1.5 hours of waiting everytime we dine here, but i love to eat their pandan chicken, fresh lumpia, sizzling bangus and maja mais or buko pandan as dessert. Hope they will improve their service next time. poor service. 50 min. waiting more power.